Last time you took your car in for an oil change, the technician may have talked to you about your power steering fluid. As you can probably guess by the name, power steering fluid is a hydraulic fluid used in the power steering system. The fluid is what provides power to the system and assists you when turning the steering wheel. If you’ve ever driven a car without power steering, or even a go kart for that matter, you know the difference that power steering makes. How does it need to be changed or topped up? 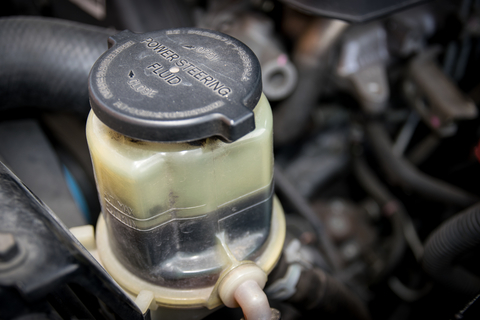 There is a lot of debate as to how often power steering fluid should be changed. Some technicians will recommend a systems flush and new fluid every 2 years. Others will give ranges between 50,000km and 200,000km, depending on who you ask. Even a quick online search will give you a number of different answers. Ultimately, the best way to determine if your fluid needs to be topped up or changed is to take a look at it! Most power steering fluid reservoirs are either transparent or come with a dipstick that has minimum and maximum levels. As long as the fluid level falls between these two marks, you don’t need to top up the fluid. The second thing to pay attention to is the colour. Power steering fluid is usually clear, amber or pink. Though it’s normal for the fluid to darken over time (i.e. red instead of pink), if the fluid is black, dark brown, or gritty it should be changed. If the thought of checking your power steering fluid is a bit overwhelming, don’t worry. You can always get a mechanic to check for you during routine maintenance or oil changes. How important is power steering fluid? Power steering fluid is what adds the “power” to the system. Without it, you may notice that your vehicle is more difficult to turn. It’s also the cheapest part of the power steering system, with a flush starting around $100. It goes a long way to keeping the system running smoothly. Without it, the power steering pump will run dry, running the risk of total failure. This is a costly issue to fix and can leave you out thousands of dollars depending on the extent of the damage. Simply put, it’s well worth maintaining your power steering fluid. Power steering fluid is just one of many fluids your car requires to run in top condition. For any questions about your vehicle fluids or to request a service appointment, contact Park Muffler today!